Variance analysis is a most used tool by accountants to review and control of responsibility center operations [that use standard cost system] and as facilitating factors in judging managerial performance in general. I have discussed single variance analyses on various post in the past, but I haven’t discussed mix and yield variance analysis yet. So, in this post I discuss mix and yeild variance analysis. Through a single case example demonstrated in this post, you will learn what mix variance is, what yield variance is and how both types of variance computed and recorded. Enjoy! What Are Mix And Yield Variances? The material mix variance measures the impact of the deviation from the standard mix on material costs. The material yield variance measures the impact on material costs of the deviation from the standard input material allowed for actual production. What Causes Mix And Yield Variances? How To Compute Mix And Yield Variances? The material quantity variance is divided into a material mix variance and a material yield variance. 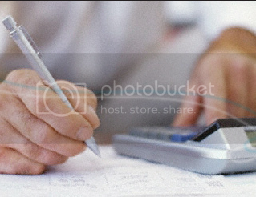 Compute the material mix variance by holding the total input units constant at their actual amount. Compute the material yield variance by holding the mix constant at the standard amount. The computations for labor mix and yield variances are the same as those for materials. If there is no mix, the yield variance is the same as the quantity (or usage) variance. Note: The material price variance is isolated at the time of purchase. We want to compute the material purchase price, quantity, mix, and yield variances. We also want to prepare appropriate journal entries. The material quantity variance computed below results from the change in the mix of materials as well as from changes in the total quantity of materials. The standard input allowed for actual production consists of 1,275 lb of Material A, 1,700 lb of Material B, and 1,275 lb of Material C, a total of 4,250 lb. The actual input consisted of 1,160 lb of Material A, 1,820 lb of Material B, and 1,480 lb of Material C.
The total of variance is subdivided into a material mix variance and a material yield variance, as shown below. 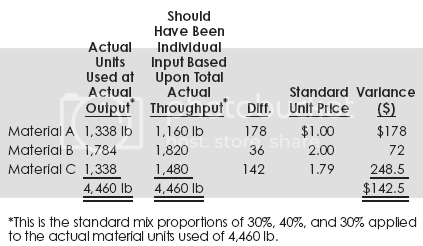 *This is the standard mix proportions of 30%, 40%, and 30% applied to the actual throughput of 4,460 lb or output of 4,250 lb. **The material yield variance of $341.25 U can be computed alternatively as follows. Quality materials, consistent with established standards are being used. *See the previous table for the numerical computations. The change in labor cost resulting from the efficiency of the workers, measured by a labor efficiency variance. (In finding the change, allowed hours are determined through the material input). The change in labor cost due to a difference in the yield, measured by a labor yield variance. (In computing the change, actual output is converted to allowed input hours). This division is necessary when there is a difference between the actual yield and standard yield, if responsibility is to be fixed. The producing department cannot be rightfully credited with a favorable efficiency variance of $6,125. Note, however, that a favorable yield variance, which is a factor most likely outside the control of the producing department, more than offsets the unfavorable labor efficiency variance of $1,341.66, for which the producing department rightfully should have been responsible. Related Topics:How To Compute Mix And Yield Variances?Journal EntriesJournal Entries For Material Mix and Yield VarianceJournal Entry To Charge Materials into ProductionJournal Entry To Record Material PurchasesJournal Entry To Transfer Material Costs to Finished GoLabor Efficiency VarianceLabor Variance AnalysisLabor Yield VarianceMaterial Mix VarianceMaterial Quantity VarianceMaterial RecordMaterial Variance AnalysisMaterial VariancesMaterial Yield VarianceMix and Yield Variance AnalysisMix and Yield Variance Analysis Case ExampleWhat Are Mix And Yield Variances?What Causes Mix And Yield Variances?